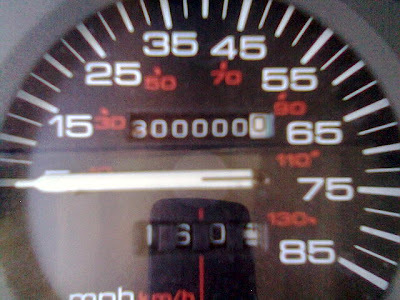 My daily driver know affectionately as White Jeep turned over 300,000 miles recently. This Jeep has really been a very reliable vehicle. The oil gets changed occasionally and it gets driven a lot. It has been raced, rallied, rally crossed , run off road, towed trailers and generally been well used. It has even been overheated severely a couple of times. Over the years I have had to change the alternator twice. I have installed a half dozen or so sets of spark plugs. Changed the plug wires a time or two. I have changed the rear oil seal once and installed a new harmonic damper and seal in the front. I have swapped the radiator a few times and had the head cleaned out by the dealer due to overheating issues. The front control arm bushings were replaced with poly years ago but it is still running the original track bar. I have swapped the front wheel bearings more times than I can remember and installed several sets of high performance brake pads. The leather seats are getting a bit ragged and I have worn out three steering wheels. The Ac compressor recently quit but otherwise this Jeeps runs and drives great. I could not have asked for a more reliable and fun truck to drive. Year of the white Jeep??? Playing in the rock garden at Harlan.